Oscar Carreño (Country Manager for Colombia, South America) is proud to announce the expansion of our Colombian network to include the opening of our newest office in Santiago de Cali, Colombia. Located in southwest Colombia, Cali is the capital city of the Valle del Cauca Department which lies between the Andes central mountain range and the Pacific Ocean. Valle del Cauca is one of the richest and most developed areas in the country and is strategically located near the port of Buenaventura, the second busiest port for the movement of containers in and out of Colombia. Vanguard Cali hopes to assist this thriving area by providing our tool chest of transportation services and applications. 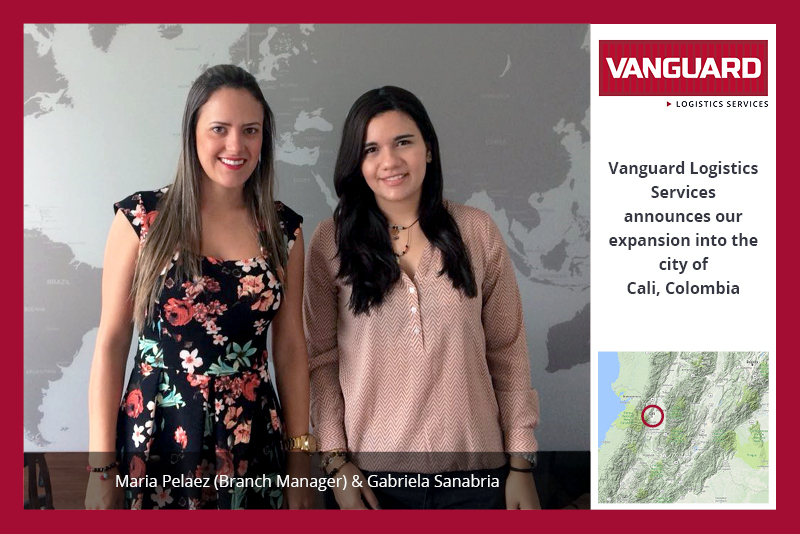 Vanguard now has offices in Bogotá, Buenaventura, Cartagena, Medellin and Cali. Vanguard Logistics Services – Santiago de Cali is located at Calle 4B #35a — 11 B/San Fernando, Cali, Valle del Cauca, Colombia and can be reached at telephone numbers: 314 470 24 72 & 317 331 05 88. Branch Manager, Maria Pelaez is a native of Cali, Colombia and holds a Master Degree in International Commerce. She has been employed by Vanguard Logistics Services for 5+ years.